In 1997, before Death Cab for Cutie was a band, Founding members Ben Gibbard and Chris Walla recorded an 8-song cassette called You Can Play These Songs With Chords. Five of those songs were re-recorded for the band's debut full-length. Re-released here in their original form, with 10 extra tracks, ranging from the unreleased to covers, outtakes, and b-sides, You Can Play These Songs With Chords finds its way onto CD. Death Cab for Cutie's latest album, The Photo Album, released late last year, was a triumph. A smart album that transcended beyond indie rock, earning the band a growing fan base and finding critics everywhere praising Gibbard and company for their ability to write clever songs that were as equally moving as they were fun to sing along with. In that regard, You Can Play These Songs With Chords is a step backwards for the band. And though its purpose is served, giving die hard fans a part of the past while documenting where DCFC originated, those unfamiliar with the band may get turned off by the rough, demo quality and not fully carried through song ideas. Listening to The Photo Album and Chords back to back makes the latter sound like a throwaway, a collection of scrapped songs that were never meant to see the light of day. However, for those completely enthralled by the band, you do get to hear Death Cab in their most rawest state, as the budding ideas for each direction the band has gone - from weepy indie rock to post-punk adrenaline rush - start to form and take shape. 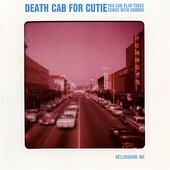 Gibbard's lyrics, a major driving force in Death Cab, are here, helping to hold up the songs when the music falls short. If you're looking for a polished record a la The Photo Album you'll be disappointed. If you crave the sloppy, bar-rock indie-pop of Death Cab's past, you're in the right place. I'll give it a B.